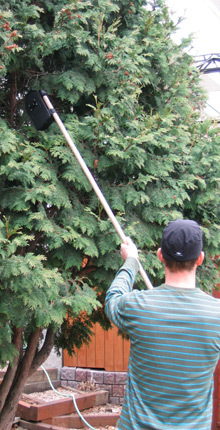 HisTree.net sells an inventory management program and provides the Trimble Nomad device to organizations that are inventorying trees and plant material. The Trimble device is used to scan the RFID tag attached to plant material and record any pertinent information regarding that item. This device would be used in rugged environments such as Tree Nurseries and city works departments, it will be exposed to the elements and hoisted up into trees in order to read the RFID tags. HisTree.net came to System Wear to have a custom case developed to meet their unique needs for this device. Case needed to be able to protect the device from the elements: ie. Water, dirt, tree sap, etc. Needed to be able to hoist the device up into trees in order to be close enough to read the RFID tags. Wanted the case to be able swivel so that it could be adjustable for user. Wanted to be able to wear it on a belt. Branded with their company logo. 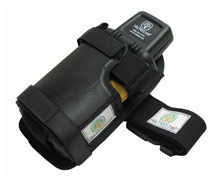 Designed a holster style case that protects the unit while being hoisted up into trees. Protects from scratches, tree sap, dirt, if it were dropped the material used provides drop protection. 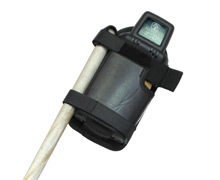 Created a special strap that allows the user to insert a stick or telescoping pole in order to elevate the device into tall trees for RFID tag reading. As per requested by our customer we sourced a specific swivel D clip to attach to the back of the case. 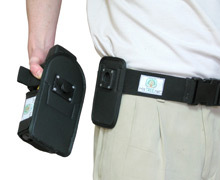 The clip allowed the user to set the device at different angles on the hip for custom comfort. 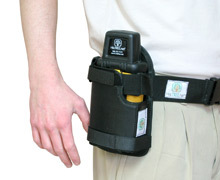 Made custom belt to carry the device on. Had our label company design a woven label for our customer which we incorporated into the design. HisTREE.net is an Edmonton, Alberta Tree and Asset management traceability company that uses RFID technology (Radio Frequency Identification).